S-5 is a wetting agent for aqueous and non-aqueous systems. It provides excellent wetting properties at very low concentrations. 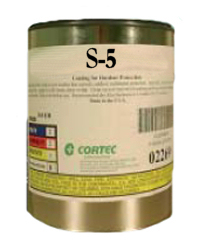 S-5 is specially designed for use in combination with Cortec's water-soluble and oil-soluble VCI corrosion systems. The recommended dosage range is between 10 and 5000 ppm. The shelf life is 2 years. Available in 5 gallon pails (Cortec Product Code 13600255). 5 gallon drum weighs 50 pounds and ships under our standard shipping rates.